Description: Topics include introduction to sports medicine, emergency action plans, upper and lower body anatomy, injury evaluation, taping techniques, and CPR Certification. 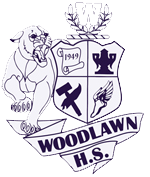 Students enrolled in this course will be required to stay after school to assist with the medical coverage of Woodlawn’s Varsity Athletics. Students and parents will be required to sign a memorandum of understanding explaining the expectations of the course. Students will be required to purchase a uniform for after school and event coverage. They are also required to participate in fundraising activities to offset the cost of the uniform. The $20 required course fee is to cover class taping supplies and CPR/AED certification. Description: Topics include advanced injury evaluation, use of therapeutic modalities, and rehabilitation techniques of the upper and lower body. Students enrolled in this course will be required to stay after school to assist with the medical coverage of Woodlawn’s Varsity Athletics. Students and parents will be required to sign a memorandum of understanding explaining the expectations of the course. Students will be required to purchase a uniform for after school and event coverage. They are also required to participate in fundraising activities to offset the cost of the uniform. The $20 required course fee is to cover class taping supplies and CPR/AED certification. Description: Topics include vocabulary related to medical profession, types of medical charting and interpretation of medical charts for patient care. Description: Topics include introduction to the EMS system, universal precautions, emergency response to all systems, primary and secondary survey of the body, triage techniques, and preparation of patients for transport to medical facilities.